In London, building on the success of The Chesterfield Mayfair’s popular Gin and Tonic Experience, the Regency style hotel, located in the heart of London’s exclusive Mayfair district, is launching two brand new bar offerings – an interactive and informative Whisky Nosing and Tasting Experience and, also for the first time, a menu of exciting Molecular Cocktails. Served in the Chesterfield’s Terrace Bar, a congenial and intimate bar with an exclusive club-like setting, the two exciting new drink menus have been carefully created by Chesterfield’s team of resident mixologists, to be enjoyed by both guests of the hotel and non-resident visitors to the bar. The Whisky Nosing and Tasting Experience guides whisky enthusiasts through a journey into the art of the master distiller. A choice of three different and specially curated menus showcase the range of fine whiskies available in the Terrace Bar collection. The flights, each comprising four 15ml measures of whiskies, are served on a specially crafted tasting tray, made from the wood of original whisky barrels. The Chesterfield’s expert explains the subtle intricacies and the history of each different whisky in an exploration for the senses. 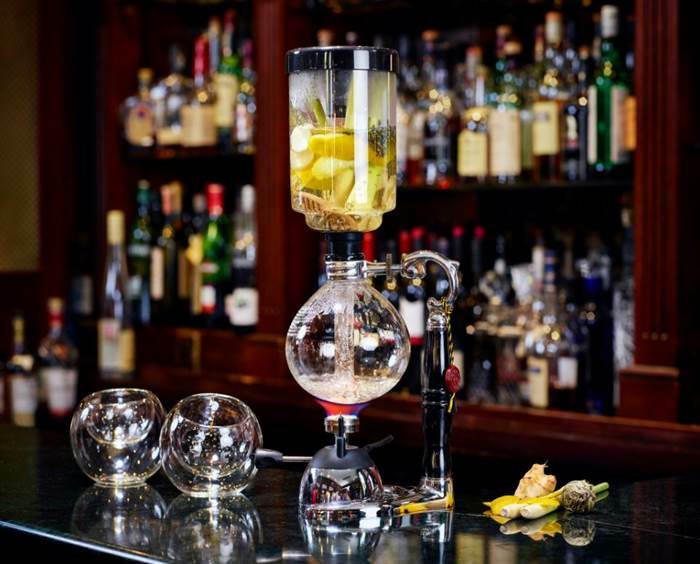 Embracing science and technology, the Chesterfield mixologists are also presenting new ways to experience much loved spirits with the introduction of a menu of seven Molecular Cocktails. Adapting the techniques of molecular gastronomy, these cocktails utilise methods such as spherification (the process of shaping a liquid into spheres) and the creation of foams and airs to create new textures, flavour combinations, and striking presentations which turn the drinking experience into something really special. · The Old and New Era Mojito (at £16), which presents two ways to enjoy this classic cocktail: a sharp tasting mojito accompanied by a spherical spoonful of the ingredients, topped with lime and vanilla air. · Eton Mess (at £16) includes an ice sphere that is hammered open to release vodka, cream and strawberry liqueur before mixing with strawberries and meringue to form a traditional English dessert with a twist. · Tequila is shaken with Cointreau and freshly squeezed lime juice with a salty foam topping, in the delicious Sea Salt Air Margarita (at £16). · To drink the Old and New Era Amaretto Sour (at £16), guests will burst open a bubble to bring out all of the sour flavours before finishing this classic cocktail, served with a scattering of almonds. For two to share, the Chesterfield mixologists have also created a Tipsy Tea (at £20), a delicious hot cocktail which dramatically infuses lavender, galangal, jasmine, lemon peel and lemon grass with water and Hendricks gin at the guests’ table; and a Healthy Pina Colada (at £19), a delicious and, thanks to the removal of the fat via a special technique, waistline-friendly combination of rum, pineapple and coconut cream. The Chesterfield Mayfair is located at 35 Charles Street, Mayfair, London, W1J 5EB. For more information, visit http://www.chesterfieldmayfair.com or call 020 7491 2622. The Chesterfield Mayfair is a member of Red Carnation Hotels, a collection of family-run, award-winning boutique hotels in the UK, Ireland, South Africa, Switzerland and the USA. Each hotel is a landmark of history and tradition; from the recently restored Ashford Castle in Ireland, to the Milestone, a historic mansion hotel in the heart of London, to the truly iconic Oyster Box in South Africa – these hotels are unique and characterful with a personal approach to hospitality. With a peerless reputation for exquisite fine dining, leading spas and sumptuous surroundings, the hotels pride themselves on delivering warm, thoughtful and highly personalized service. For more information about these award-winning hotels and the rest of the Red Carnation Collection, go to http://www.redcarnation.com.